1957 – Death of Fr. Aloysius Roche, Irish patriot. During Easter Week 1916, Fr Aloysius along with Frs Albert, Augustine and Dominic brought spiritual aid to the Volunteers in the numerous garrisons and outposts throughout Dublin. Following Padraig Pearse’s surrender on Saturday, 29 April 1916, Fr Aloysius spent the next day carrying the surrender order to the main garrisons on the south side of the city. In the early hours of the morning of 3 May, Fr Aloysius administered the last sacraments to Pearse, Mac Donagh and Thomas Clarke, the first three leaders of the Rising to be executed. On 7 May, he met John Dillon, a leading member of the Irish Parliamentary Party, who agreed to do all in his power to persuade the British government to stop the executions. And it was largely due to his efforts that Dillon, five days later, during a debate on the rising in the House of Commons, launched a blistering attack on the British government’s handling of the situation in Ireland. Earlier that day, Fr Aloysius accompanied James Connolly by ambulance from Dublin Castle to Kilmainham Jail for execution and stood behind the firing squad as they fired the final volley. During the Tan and Civil Wars he was an enthusiastic and practical supporter of the national struggle and continued his republican allegiance throughout the following decades. 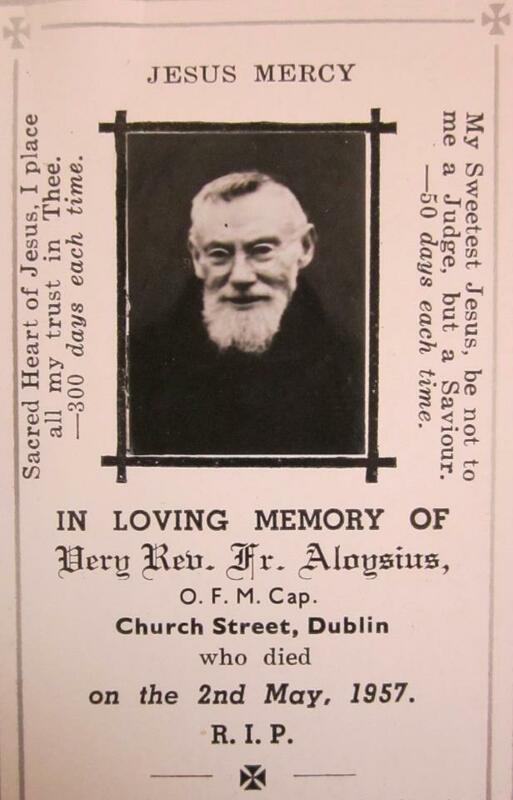 The tall figure of Fr Aloysius was a familiar sight along Dublin’s quays for over fifty years. 1945 – Eamon de Valera offers his condolences to the German Ambassador, Edouard Hempel, on the death of Adolf Hitler.